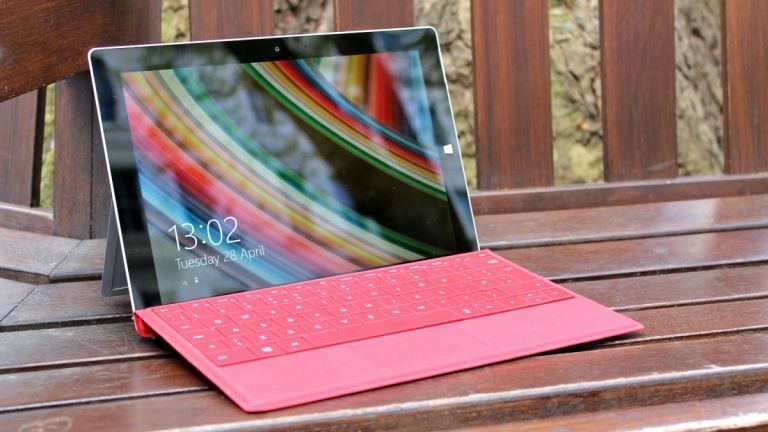 Microsoft Surface 3: A blueprint for small and light 2-in-1 tablets? Despite not being as feature-packed as the Surface Pro 3, it has a few tricks up its sleeve. The Surface 3 is the less powerful but more affordable cousin to the Surface Pro 3, which remains Microsoft's most convincing attempt at a tablet that can replace your laptop. Microsoft has made a slightly cheaper device that cuts a few corners this time around, but don't be fooled: the Surface 3 is about as budget as Waitrose. In other words: not very. Compared to Windows tablets with similar specs, such as the Asus T100 Chi (pictured below), it could even be considered pricey. The entry-level model comes with a paltry 64GB of storage and Windows 8.1 (upgradable for free to Windows 10) for £377 which rises to £475 once you've added on the cost of a Touch Keyboard cover to get the full Surface experience; hardly spare change. You'll need to cough up £597 to get the 128GB version, which provides the minimum amount of storage we're recommend unless you store most of your files in the cloud. The Surface Pro 3, meanwhile, tots up to £673 for the entry-level 64GB model (or £867 for the 128GB configuration) once you've added on the cost of a keyboard. So, apart from saving around £200, is there any reason to plump for a Surface 3 over its Pro-monikered relative? In a word: yes, although, unless you're desperate for a Surface tablet now, you might be better off giving both devices a miss and hanging on for Microsoft's upcoming Surface Pro 4. If you can remember the Surface 2 from a few years ago, the Surface 3 looks pretty much identical - only thinner. Crafted from the same magnesium-alloy chassis as other Surface tablets, its silver-and-black finish lends it a sophisticated two-tone appearance. Even after all these years, Surface tablets still look pretty cool. At 8.7mm thick it's skinnier than the Surface Pro 3, and at 1.3 pounds it's lighter too. The reductions in size and weight make it the more comfortable device for holding in one hand and jotting down notes with the Surface Pen, or for reading something on its screen. One of the best best bits about the Surface Pro 3 was its multi-position kickstand, which unfortunately hasn't made its way to the Surface 3. Instead it has a three-position kickstand which isn't quite as flexible but does a good enough job of allowing you get into a comfy position for interacting with the screen whether it's rested on a hard Surface or your lap. The Surface 3's 10.8-inch, 1,920 x 1,280 pixel-resolution touchscreen display is smaller than the 12.1-inch display on the Surface Pro 3, but it's every bit as clear. Its PPI of 213 (versus the Surface Pro 3's 216) makes text easy to read, and images look superb thanks to its rich colours. Reflections are inevitable due to its glossy nature, but they're not a huge problem. Better yet, it's stonkingly bright, even to the point where you take it outside and catch up on your favourite eBook. We're not talking Kindle levels of readability, but it's better than many other tablets with IPS displays. As with the Surface Pro 3, the Surface 3's display has a 3:2 aspect ratio which aids multi-tasking by providing plenty of room for snapping apps and windows to parts of the screen. If you're used to having tons of ports on a laptop then you probably won't be happy with what the Surface 3 offers in this area. There's MiniDisplay port and micro-HDMI for hooking up to an external display, along with a microSD card reader, headset jack, cover port and micro-USB port for charging. The Intel Atom chip in the Surface 3 makes it a different kind of device to the Surface Pro 3, which features Intel's full Core-series processors. The former device is designed for light computing tasks, such as browsing the internet, light image editing, productivity work and watching video. While you can run Photoshop CC 2014 perfectly fine on the Surface 3, any tasks that require a meaty processor - such as exporting large image files, takes a lot longer than it would on computers with more powerful processors such as the Surface Pro 3. We carried out a range of tasks on our review sample, which featured 64GB of storage and 4GB of RAM. It stood up to most tasks well, handling multiple browsers at the same time with up to 10 tabs open each without creaking at the knees. It should be noted that our review model had 4GB of RAM, whereas the cheapest Surface only ships with 2GB. We expect that model's performance would take a hit as a result. On the plus side, the processor inside the Surface is passively cooled, meaning the tablet doesn't have a fan inside and doesn't make any cranking or whirring noises under use. It's something you don't appreciate until you've been using a wheezing loud laptop for years. Another benefit in this area is battery life. Intel's Atom processor consumes a low amount of power, and we managed to eke out 7 hours and 55 minutes from a single charge under PCMark 8's test. That's an impressive figure, and one that indicates you won't have to reach for the mains socket too often when you're out and about. Being a 2-in1 device, the Surface 3 can be used in a few more ways than a traditional laptop. Once magnetically locked into place, the keyboard can be used at two angles: completely flat, or slightly raised. By folding the keyboard's lip over and attaching it to the bottom of the screen, the second option makes the Surface less wobbly when it's on your lap. Even so, neither positions can save the keyboard from what it is: a horribly cheap accessory that's been designed for convenience and portability rather than bashing out lengthy documents. That can be alleviated slightly by using the bundled Surface Pen to tap at menu icons and select icons on the screen. One of the best parts about the Surface 3, it can bring up OneNote in a snap for doodling and taking notes, or you can capture screenshots by pressing a button on the pen itself and drawing around what you want to highlight. The Surface 3 is a worthy addition to Microsoft's tablet line that would make a good second device for most people. From its impressive display to its handy Surface Pen and classy design, there's a lot to like. It's powerful enough to carry out basic tasks, and it could chew through more demanding ones too - just don't expect it to do them very quickly. It's hard to recommend the Surface 3 over its more expensive cousin if you plan on using it as your main device. With beefy Intel Core processors, a larger screen and a better kickstand, the Surface Pro 3 has many more features for not a lot more money. The only way we can really recommend opting for the Surface 3, cost aside, is if you need the most compact Surface tablet on the market for transporting around. If that's the case, it'll be right up your alley.